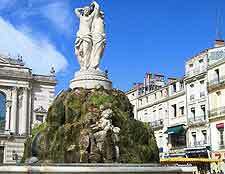 Montpellier is a lively, cosmopolitan city which boasts many different kinds of hotel accommodation. Hotel options range from budget rooms to top-of-the-range suites. Many of Montpellier's hotels are located within traditional town houses with plenty of character. Nevertheless, Montpellier is constantly undergoing change and so the city also caters more than adequately for those visitors who prefer lodging in modern buildings with all the latest mod cons. It's worth noting that Montpellier can get quite busy during the summer months, particularly as these coincide with the city's main festivals. If you're planning to stay in the city centre, or have a particular hotel or guesthouse in mind, it's definitely worth booking accommodation ahead. 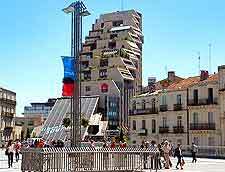 Montpellier's Tourist Office is a useful source of information about lodging in the city and surrounding area. 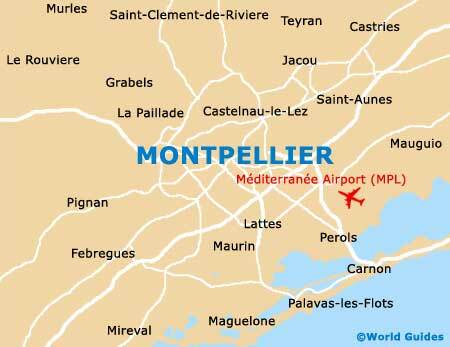 Montpellier has a number of relatively small family hotels, which offer cosy accommodation and good value for money. Some are noted for their location overlooking quiet squares, whilst others decorated and furnished in an individual style and provide visitors with more character than larger, commercial hotels. 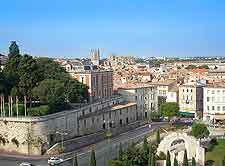 A large number of Montpellier's hotels are concentrated in the area around the Place de la Comédie, as well as in the Old Town district. The area around the train station is also a convenient place to stay if you're just passing through or plan to travel around. Montpellier's most luxurious hotel is Le Jardin des Sens, situated right at the centre of the city. As well as offering top-notch accommodation, the hotel's restaurant has acquired a nationwide reputation. Budget travellers can opt for Montpellier's Auberge de Jeunesse, a youth hostel providing cheap dormitory accommodation on the northern edge of the city. Alternatively, as in most French cities, there are also a number of chain hotels, although these are located outside the city itself. The warm summer months always attract plenty of campers to the city's several campsites. The closest of these is around 4 km / 2.5 miles from the centre of Montpellier. For visitors who find it more convenient to self-cater during their stay, Montpellier has two residential hotels. One is situated next to the University's science faculty, while the other can be found within the modern Antigone District of the city.